I went for my 34 weeks check up on 19th Dec. We brought Ryan along that day. It was the first time.Â Hubs gave Ryan a briefÂ explanation onÂ the scan images on the monitor screen. Not sure ifÂ Ryan could see much as myÂ oh so traditionalÂ obgyn is still using the 2D color machine. This is so unlikeÂ my previousÂ obgyn in SG who had this canggihÂ 4DÂ scanner which transmits live scan results directly into his computer for immediate correlation. Today,Â a week plus later from my last visit,Â I went to see my obgyn again for my bi weekly check up.Â He did a swap testÂ to ensure I’mÂ free from infections.Â Baby is now at 3.03kg. Head’s down but not engaged. He’s expected to weigh around 3.4kg at birth. I stood on the scale and boohoo.. I’m officially 65kg now. I wonder if I’ll hit 70kg in a few weeks’ time. Cryocord rep came to see me at my obgyn’s office to discuss on umbilical cord blood storage. In terms of package pricing, they are the same as Stemlife, maybe RM100 slightly more than the latter. 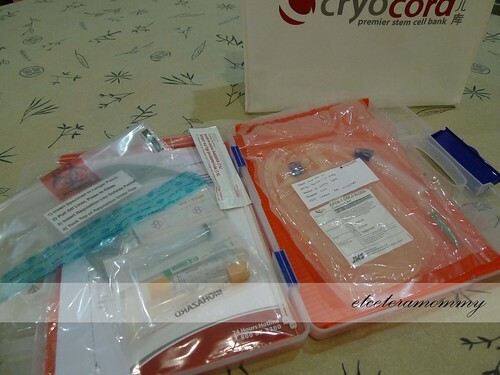 However, I chose Cryocord this time since Ryan’s cord blood cells are stored with Stemlife. It’s always wise not to put all eggs in one basket. Changes in mommy?? Oh yes!!! Since the last few weeks, getting a good night sleep has become increasingly a challenge. I lost count the number of times I woke up middle of the night due to the discomfort from changing positions.Â Now that my tummy is at the size of 41inch, it’s no wonder getting a good sleeping position, which was once so effortless Â has become such a major operation now. I continue to get twinges and achesÂ fromÂ lil b’s kicks and punches. I had the same experience with Ryan, both with equivalentlyÂ strong and vigorous movements. Like brother, like brother. There were a couple of times, when we were outÂ I had to use a shield (myÂ bag)Â to cover the drastic changes in theÂ contours of my tummy; saving me the effort from explaining. I see a proverbial beached whale whenever I see my reflection on the mirror. I am physically compromised and getting more and moreÂ clumsy. There were a few times my helper had to help me pick up the things that dropped when I passed by the shelves in shopping malls. It was bad but I convinced myself that my big bag was the culprit. 2 -3 more weeks to go before the big day, IÂ received a lot of advise to get as much rest now. How I wish. Sleeping well is now a challenge and Ryan will start his kindy next week. Back to busy routine days. To make matters more complicated, Ryan’s playmate (my helper) is on the way to the airport (as I type) for her long deserved 2 weeks holiday in Philippines. I’ve always wanted to bring Ryan for a movie. When Up was showing few months ago,Â we missed the opportunity. Not sure what I was busy with then but somehow we did not make it. 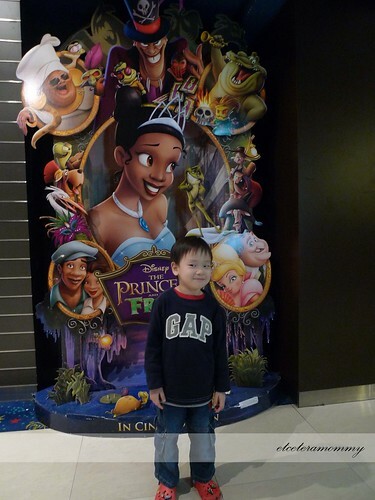 I came across Princess And The Frog on paper last week and I was adamant to bring Ryan this time. Afterall, lil B will be arriving in approximately a month’s time. After the arrival, I would definitely be less mobile. So yesterday off we went to Cheras Selatan for the 1.45pm show. I was optimistic we would be able get good seats therefor I did not make any advance booking. That proved to be a mistake. The good seats were all taken and I was left with the option of seats 6th row from the screen. I decided to take a rain check. This morning, Ryan woke up around 9.40am. I’m very sure he will skip his nap so I made plans to go for the movie today. Lesson learned. I made an onlineÂ booking forÂ the 1.45pmÂ show at Mid Valley for 2 adults (RM9 ea)Â and Ryan (RM6 ea). I chose the seats on last row. Wise choice. Ryan was very excited. He was full of questions the moment we settled on our seats.Â He was curious to know every tiny details from the cinema settings, lightings, screen size downÂ to the speakers behind our seats. Ocassionally IÂ also acted as the movie’s narrator for this little fella. I’m not sure if Ryan truly enjoyed such a show as certain parts were quite wordy for a child his age but I for sure have no regrets.Â I especially love the part Ryan leaned on my arms quietly watching the flow of the story. So S-W-E-E-T. The movie ended about 90 minutes later. I asked Ryan if he enjoyed the movie. He screamed YES! without hesitation. I’m not sure if he truly understand the whole story line but it was indeed a good experience for both of us. I have no qualms and I’m very sure we would have our 2nd experience again pretty soon. Back in KL. The first week was tough as neither hubs or me have gotten our ‘wheels’. FIL was hubs’Â chauffeurÂ for a week and after I got my car (11th Nov), I took over the chauffeuring task. That lasted another few days. 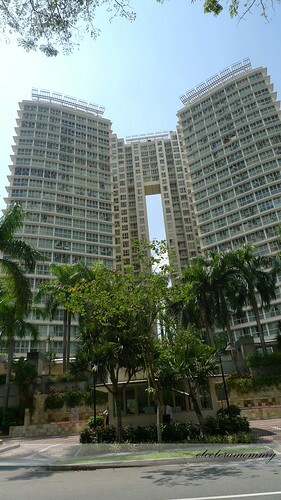 HubsÂ collected his gem on 14th Nov.Â Driving in KL drained my brain juice. There’s a huge difference between driving in Singapore and in KL. Not to mention the traffic congestion around the clock.Â Phew. Meanwhile, Ryan is adapting very well. Occassionally he tells us he misses his friends and teachers in Singapore but that’s about it. Kids are definitely more adaptable. I think he is enjoying the bigger space, the extra attention showered on him, and the freedom of not having to go to school and play all dayÂ at home. We have registeredÂ Ryan with Seri Soka Kindergarten few months ago after knowing we would be back for good. We visited the school after our return for the so called assessment which the school required before the child is officially accepted into the school. Ryan was not very cooperative. The moment we told him we wereÂ visiting his ‘future’ school, he gave us the cold shoulder. He told us he doesn’t like KL school (he doesn’t even know how the school looks like then), he said he doesn’t like his KL friends, eventhough he has no indication who are they). At the school, we spent some time speaking with the person in charge while Ryan enjoyed his dose ofÂ playground. We were then brought around the school. Ryan was evidently less resistable and more open upon seeing the art work displayed outside the school’s classrooms. It’s not going to be an easy transition I know. I Â just hope things would work out better than my expectation if we really do decide to go with this school. Till then,Â we will continue our search for an alternative; not because Seri Soka is not good. It just that we are exploring the private and international Primary schools around the area and it only make sense to send Ryan to the kindy offered by the school. Search in progress…..
It’s the school holiday here and it’ll be at least another month before he starts school. BB2 will be arriving soon and I really want to take the opportunity to spend more time with Ryan so I did not sign him up any holiday programmes. IÂ DIY a stack of new phonic cards for Ryan.Â He has completed the 3 letter words ending ‘an, ap, at, am’. He progressed very well and we’ll be moving on to ‘as, ag, ax, ab’ and will follow up with the consonants. He’s now into Wii and is addicted to playing games on hubs’ iphone. Months back, we thought of buying him a PSP but looking at the level of his addiction, we brushed the thought aside. As for me.. I’m doing well. 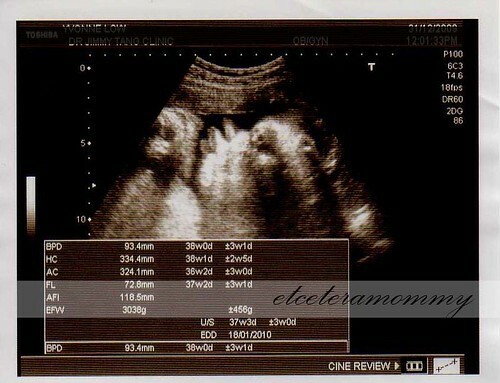 Visited my ob-gyn on the 21st Oct for my 2 weeks overdue 7th month checkup. It was an uneventful visit. BB2 was at 30 weeks by dateÂ however he recorded a gestational size of 32 weeks + 4 days and 1.9kg with head down position. I stepped on the scale and it showed 61.5kg. Another 3.5kg gain in 6 weeks. No wonder my tummy grew so much bigger in the last few weeks. I really do look like a walking whale now. Side track. We went for On Hong Concert on 7th Nov (hubs’ birthday) at Genting Arena of Stars. It wasn’t a fantastic concert (duration was short andÂ they really don’t have that many songs that I like)Â but they did sing some good 90s songs that I appreciated. So it was not bad. Not sure about hubs *evil* but at least I was entertained.Â That was pretty much how we celebrated his birthday. 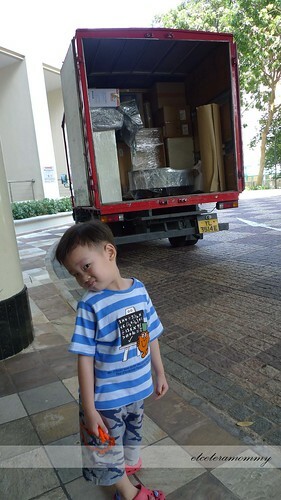 In the background, the 20ft lorry the mover had arranged to transport our furnitures from SG – KL. We accumulatedÂ more than 40 boxes of ‘goods’Â in our 2 years plus in SG.